We’ve learned a lot raising and selling selectively bred poultry for coming up on 5 years. These chickens are not for everyone. They definitely are not for the first time chicken owner. These are not the birds to buy if you want a small backyard flock. 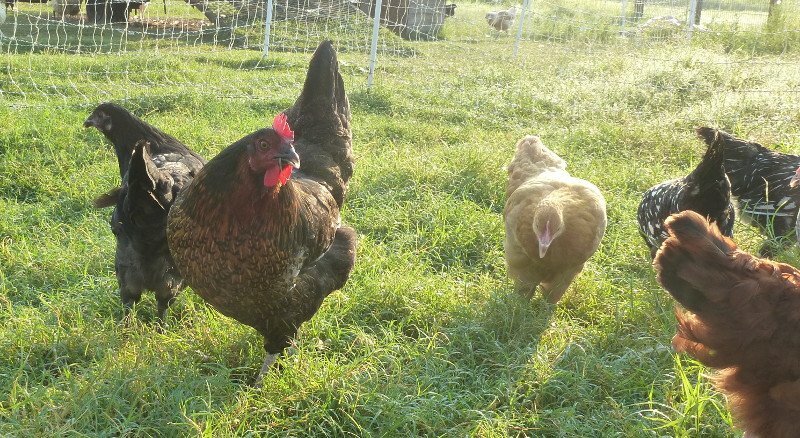 A backyard flock needs pullets that will be good egg layers. Our birds are sold straight run. I made the mistake of selling small quantities of chicks to people that were ‘hoping’ for more females than males. And guess what, 2017 was the year of the male. Our Delawares and Barred Plymouth Rocks, and to some extent the Rhode Island Reds show a lot of variability. This means that you will get some really good birds, and some that are not very good at all. The Black Australorps and New Hampshire Reds seem to be more uniform, though there are some that are not very good. Without variability, there is not much to work with. With variability, we have clear selections to make as we set the flocks. There are hatcheries that are selling Rhode Island Reds that are just about as good as mine. I really like mine, but they are VERY slow maturing – and I’m not sure I’m adding any value over what you could buy from some of the larger hatcheries. So the upshot of all this is that we are only going to sell our chicks to those who are wanting to selectively breed the birds or who are going to use them in a true dual-purpose fashion – meat and eggs. No more ‘hoping’ for more pullets than males. If you want pullets – buy pullets. Our minimum order will be 50 chicks will be 25 chicks of the same breed. I don’t see any number less than 50 being worthwhile for either breeding or dual-purpose use. We will not be selling the chicks directly off of the website as I want to be sure you understand what you are getting and that you meet the requirements for buying the chicks. If you are interested, please email or call (254-829-5333). I’ll be setting eggs to order – meaning that from the time I have your money in hand, expect 3-6 weeks to get your birds depending on how many orders are ahead of you. Are these selectively bred chicks for you? You are going to continue the selective breeding to improve the flock and you understand that some many of the chicks will definitely be culls. Or, you are setting up a true dual-purpose flock and plan on eating the culls while you selectively breed to keep your flock sustainabile. If you can seriously answer yes to either of those questions, then I’d like to talk with you.